We fund £100 million of cardiovascular research annually and every pound of that investment is overseen by our Research Funds team. They make sure that donations go to high quality research, research that gets us closer to beating heartbreak forever. As the largest independent funder of research into heart and circulatory diseases, we have a track record of investing in groundbreaking work - from clot busting drugs to ICDs. Research Grant Management is at the centre of our world-leading research portfolio, funding the brightest scientists at every stage of their career, and investing in the buildings and facilities that they need. Our busy team combines exceptional administrative skills with the specialist knowledge of researchers who have joined us from the lab. They manage around 600 applications each year for research grants into all aspects of heart and circulatory diseases, overseeing funding committees and tracking the progress of grants towards exciting discoveries. 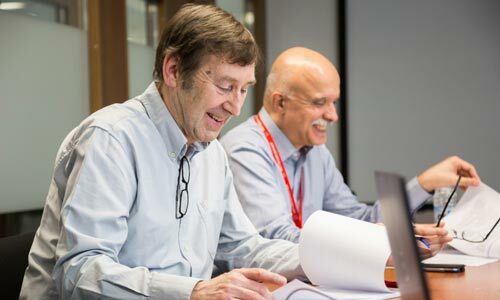 They also play a key role in the leadership of the British Heart Foundation - spotting emerging scientific trends and advising researchers, from those setting out in their careers to world renowned experts. Research Grant Management is about taking brilliant ideas, and helping steer them into research that could save millions. I came from the lab – I was a postdoctoral scientist at Imperial College London. When I decided to leave research I was really happy to have the opportunity to continue to contribute to scientific research by without being actually ‘at the bench’. At the BHF I’m involved in managing the processes by which applications for research funding are reviewed, and assessing the impact of BHF funded research. What’s the best thing about being part of the BHF? The people who work here are all dedicated, often having very personal reasons for wanting the BHF to be the best it can be. It creates a really positive working environment. Making a difference to the researchers we support, enabling them to make breakthroughs in cardiovascular research.